High-quality diagnosis of issues is the foundation for strategy development. We offer a wide range of domain expertise and develop customised methodologies suited to the needs of each assignment. Expertise includes marketing, finance, economics, operations, governance, social science, environment, sustainability, public policy, and organisation. We bring in specialists to work with us where we need deeper domain skills. Our project teams often include members from client organisations to provide deep connections with the client organisation, transfer capability, ensure buy-in to recommendations and facilitate implementation. Strong organisational effectiveness is critical for long-term success. Over the last few years we have helped clients improve their effectiveness by redesigning organisations, developing internal capabilities and leadership, and guiding multi-year transformation projects. The case study below describes how we worked with a client in the consumer services industry to transform the business and reverse profitability decline in the face of increasing competition. The positive commercial impact of the Stakeholder Strategies programme of work was significant. Strongly performing infrastructure is critical for New Zealand’s continuing success. As a team, we have worked with many leading infrastructure companies on some of their most difficult projects. We have assisted organisations to better manage their assets, improve outcomes for their customers and stakeholders, prepare for future scenarios and shifts in their operating environment, and develop strategy for long-term investment horizons. We bring depth of experience – with backgrounds as founders, managers, investors, board-members and consultants – to the New Zealand tech sector. Our recent project experience includes the validation, launch-planning and eventual launch of a SaaS start-up, venture validation and launch strategy development for a leading New Zealand venture capitalist, technology and innovation strategy for New Zealand, and globalisation strategies for expanding tech businesses. Our commitment to the success of our clients leads us to share rather than just apply our skills and knowledge. Better strategies depend on high quality strategy development, which in turn requires relevant strategic planning skills. An introduction to strategy, explaining how to achieve superior profitability through sustainable competitive advantage. A short session on assessing industry attractiveness. Global and national status, and megatrends. Strategies are more likely to be successful when they are riding sustainable trends or correctly anticipating changes. A deeper understanding of the forces driving economic, social and environmental change helps to correctly identify and evaluate strategic options. 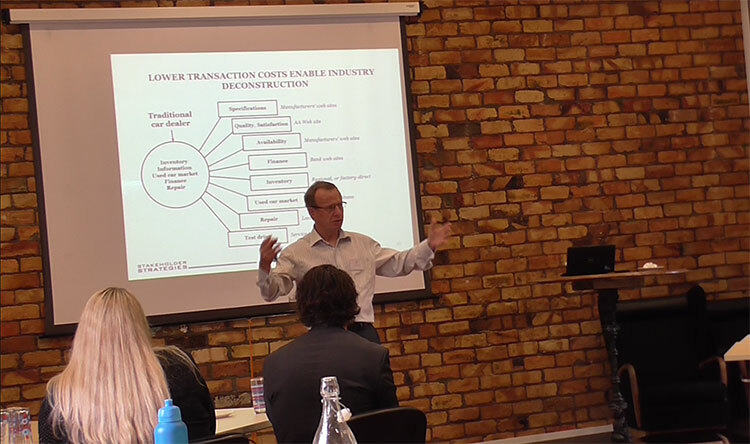 When provided for a single organisation, the workshops often have a short introduction on strategy concepts and then a series of structured sessions to analyse a strategic issue or review a proposed strategy. We identified and qualified a range of opportunities to address this competitive challenge, including improving customer orientation, new product offers, pricing changes, reducing costs, and streamlining the organisation. Once future profitability was assured an outlet growth strategy was launched. While most of our reports and outputs are confidential, below are publicly available works (including papers authored by Rick Boven while he led The New Zealand Institute). Addressing climate change, and meeting New Zealand’s Paris Agreement commitments, will require our electricity system to begin planning and adapting for the future needs of our country, today. What challenges and opportunities lie ahead? How can we enable our country’s sustainable energy future? This paper aims to provide background information for those conducting the 2013 review of New Zealand’s retirement income and for New Zealanders who wish to participate in the consultation processes. The content will also provide other interested New Zealanders with a perspective on the implications of global trends for the long-term future context for retirement in New Zealand. The paper identifies opportunities to better develop the Auckland workforce and improve productivity. The opportunities were identified by conducting interviews with Auckland’s employers and other participants in the skills development ecosystem. This paper describes the global environmental status and trends, offers some explanations for why responses are slow and weak, examines the implications for New Zealand, and proposes a strategy development agenda to reduce risks and take advantage of opportunities. This report describes opportunities for New Zealand to realise economic benefits from an improved innovation ecosystem and increased investment in R&D. The report proposes 14 policy directions to improve the success of internationalising New Zealand businesses. This report assesses New Zealand’s economic performance and identifies priorities to improve prosperity. The paper proposes that accelerated roll-out of e-learning to low decile schools and improving the school-to-work transition will materially reduce youth unemployment and resulting social issues. New Zealand is a small, remote island nation, and our isolation creates both opportunities and threats. Opportunities exist in terms of our ability to export good quality produce at a cheaper price, due to our lack of pests and diseases. However, isolation brings threats to our supply chain. Rick’s thesis argues for revision of the dominant paradigm that provides the default assumptions used for theoretical and policy analysis that affects long-term economic and environmental outcomes. The proposed paradigm changes can be used to develop a theoretically sound strategy to reduce the risk of environmental crisis.